Weirs and impounding dams may obstruct the passage of salmon or other fish unless an effective fish pass is provided. Temporary obstructions may also occur during the construction of a scheme (e.g. building of coffer dams or culverts on temporary roads) and the needs of fish must be considered. Depending on the design of a turbine, fish passing through it may be killed or injured from changes in pressure or by being struck by turbine blades. It may therefore be necessary to provide screens at the intake to keep fish out. Screens may also be necessary at the downstream end of a tailrace to prevent fish entering it. Fish may be adversely affected by pollution arising during the construction and operation of a scheme. As well as the hydrological effects of catchment transfer, fish can gain access to previously uninhabited watercourses via the tunnel used to transfer water. This could potentially lead to the transfer of water-borne infection. Salmon are thought to recognize chemical attractants in their home waters, so catchment transfer also has the potential to mislead fish up a ‘wrong’ tributary. 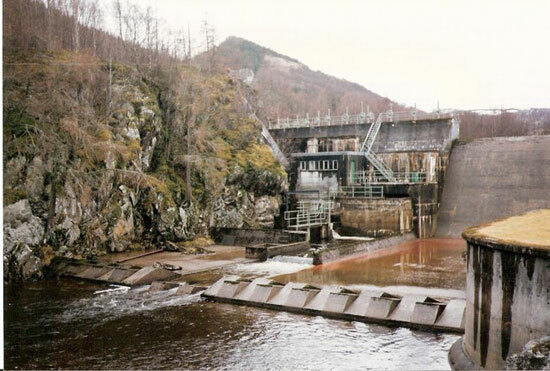 In run of river schemes there is usually a large reduction of flow in the river channel between the water intake and the discharge from the power station. This may also occur downstream from the impounding dam of a storage scheme. If a sufficient residual flow is not provided, the stocks of fish in these areas will be lost or significantly reduced and the passage of migratory salmon will be prevented. A required residual flow is usually called a ‘compensation flow’. If a stretch of river is dammed, the resulting reservoir may destroy fish spawning grounds or nursery areas. 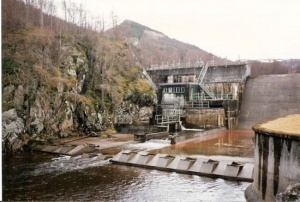 In storage schemes, depending on the pattern of generation, the flow downstream of the power station may fluctuate markedly and this could adversely affect fish or fisheries. The water level in the reservoir may also fluctuate, affecting fish stocks. Catchment transfers can result in substantial changes in flow in the affected catchments with consequential effects on fish or fisheries. There are other indirect effects, such as changes in sediment transport which can alter the character of a river bed, which in turn may affect fish stocks. Generators of electricity are required to, “avoid, so far as possible, causing injury to fisheries or to the stocks of fish in any waters” (Schedule 9 of the Electricity Act 1989). Fisheries Management Scotland works at a strategic level, in order to influence the prioritisation of the CAR-license review process towards ensuring free passage of wild salmonids and ensuring that adequate compensation flows are provided to allow fish to migrate through the river. A key driver for this is the River Basin Management Planning process which prioritises such work between the 6-year planning cycles.